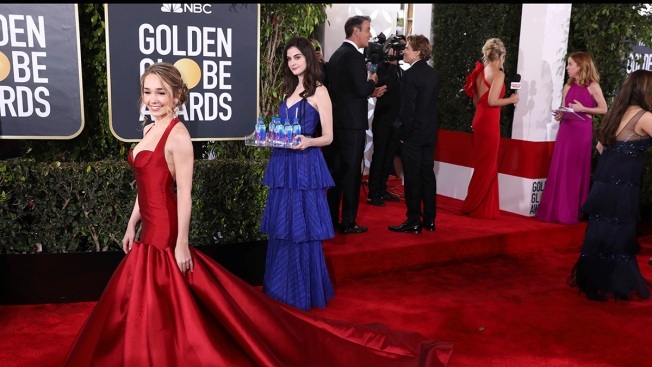 Holly Taylor at the 76th annual Golden Globe Awards with model Kelleth Cuthbert in the background holding FIJI Water on Jan. 6, 2019, in Beverly Hills, Calif. The woman who went viral by photobombing celebrities while holding a tray of Fiji Water at the 2019 Golden Globes is now suing Fiji Water for attempting to capitalize on her sudden fame. Court documents obtained by E! News reveal that the star, whose stage name is Kelleth Cuthbert, is suing the brand for "the unauthorized use of [Fiji Water Girl's] photograph, likeness and identity." In plain terms, the model is suing the company for using her image as the focal point of a global marketing campaign, which was inspired by Kelleth's viral moment on the red carpet of the award show. This isn't Cuthbert's, whose real name is actually Kelly Steinbach, first brush with controversy. Jamie Lee Curtis was an outspoken opponent to Fiji Water Girl's photobombing and posted a lengthy statement slamming the viral moment. The actress said she "specifically moved away from the blatant" advertising that Cuthbert was a part of. "I knew why there was a photographer poised there and I moved away as I said out loud that I didn't want to be doing advertising for either," the "Halloween" star claimed. "Clearly this angle shows that I moved from her being behind me and yet from the side it still happens."